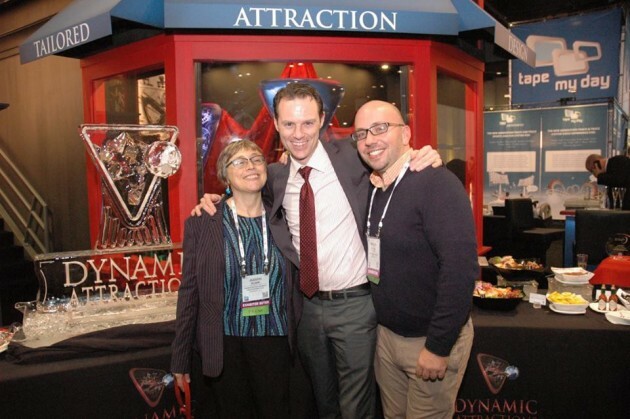 ABOVE: InPark’s Judith Rubin and Martin Palicki with Dynamic Attractions’ George Walker at the IAAPA Attractions Expo 2015. Orlando, FL, USA (November 18, 2015) — Dynamic Attractions, a leader in media-based attractions for major theme parks, is expanding with a new office in Orlando and an ‘industry first’ service called Unlimited Attractions. The announcement was made today at the International Attractions and Amusement Parks Association (IAAPA) annual convention in Orlando, Florida. Unlimited Attractions is a new service that integrates all of the show elements that turn a ‘ride’ into an ‘attraction’: story concepts, lighting, scenery, media, and special effects. By coordinating the development of the storytelling along with their highly sophisticated ride systems, attractions can be more impactful. This results in seamless attractions and better guest experiences. The company’s new Orlando Attractions Development Center will be opening in spring 2016. The 32,000 square foot facility will include an ‘experience’ studio with fully operational rides. It will also offer an ‘Imagination Think Tank’ for the company’s attractions designers and theme design partners to invent the next generation of media-based, interactive attractions. It will complement the company’s current locations in Vancouver, Toronto, Arlington (Texas), Dongguan and Shanghai.